This brunch bake is perfect for entertaining. Pancakes are layered with a creamy filling, blueberry jam and fresh berries. 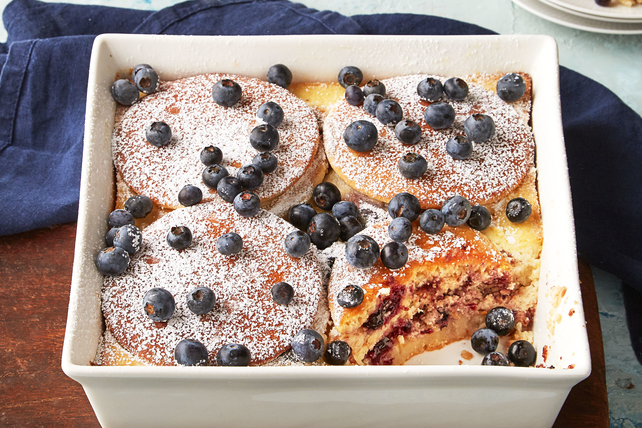 Served with a side of maple syrup, this Blueberry-Lemon Ricotta Pancake Bake is delicious! Mix cream cheese spread and eggs in medium bowl until blended. Add ricotta, granulated sugar, vanilla, lemon zest and lemon juice; mix well. Place 4 pancakes in single layer on bottom of 8-inch square baking dish sprayed with cooking spray; top with layers of 1/3 of the cream cheese mixture and 1/4 cup jam. Repeat layers. Cover with remaining pancakes and cream cheese mixture. Place dish on baking sheet. Bake 45 to 50 min. or until centre is set and edges are golden brown. Sprinkle with icing sugar; top with blueberries. This delicious recipe can be assembled ahead of time. Refrigerate up to 24 hours before baking as directed. The baking dish is baked on top of the baking sheet so the baking sheet will catch any juices that might bubble over the side of the baking dish as the dessert bakes. Start off your day with this quick-and-delicious main dish. Serve with a seasonal fruit salad to round out the meal.